If you’ve got more than you in your organization, you’ve got to deal with a team and get them motivated to do what you need done. I’ve believed for a long time that you really can’t motivate people. They’re all self-motivated. They just might not be motivated to do what you need them to do. 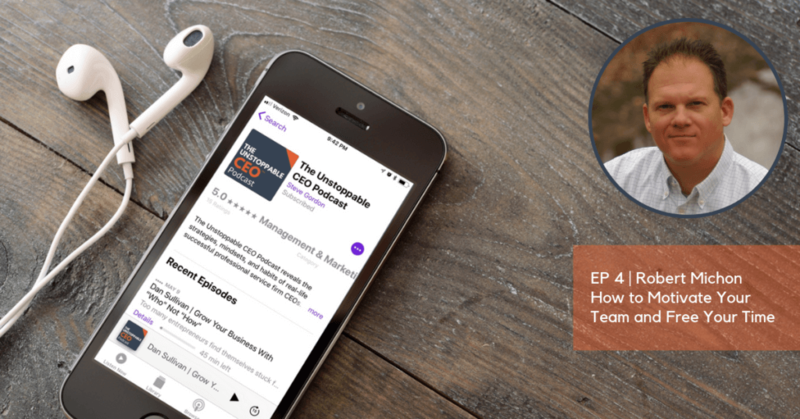 In this week’s episode of The Unstoppable CEO™ Podcast, I sit down with Robert Michon to discover his unique approach to aligning the roles you need with the natural motivations of your people. Robert shares the tools he uses to assess motivation, and how you can use them to align your team. Oh, and Robert shares his “Thought Tracking” technique for clearing out disruptive negative thinking so you can get focused on the great work you’re doing. This little tip (at 10:13 into the interview) will help you get and stay at the top of your mental game. 00:13 Steve introduces Robert Michon. 01:26 Robert starts off by telling us how he learned he didn’t want to be a doctor, or work for somebody and how it lead to where he is now. 04:41 Robert tells us what he has learned over the years that has lead to his success- ask for help, but not from your friends and Thought Blogs. 10:13 Robert discusses the effects of his Thought Blogs has on his clients and just how quickly they work. 13:16 Robert tells us why what got you to where you are won’t get you much further and what can push you past 7 figure earnings. 16:34 Robert talks about coaching entrepreneurs, the issues he has collaborating with virtual teams and how he realized to solve those issues. 22:56 Robert tells us that turnover is expensive and he explains to us why we should try to motivate all employees and gives a real life example. 30:17 The way you solve a problem, your “how” differs from other people. Robert tells us not to care about how you get there, just that you do indeed end up there. 34:00 Robert gives us two books to read that can help you if you’re in a funk and one that he is currently reading.